CAT IN THE HAT... IN A HAT! The mysterious cat of Dr. Seuss tales always seems to appear whenever a dull day is threatening to darken the doorway. With a series of playful pranks and magical mirth, this chaotic critter is going to teach anyone what it means to have fun, even if it means unleashing the Things! Of course, once you think you know what you'll get with the Cat, he's bound to change things up. Predictability just won't work for this crazy feline. So, get ready to be shocked and amazed by the newest way to interact with the Cat... in a hat! 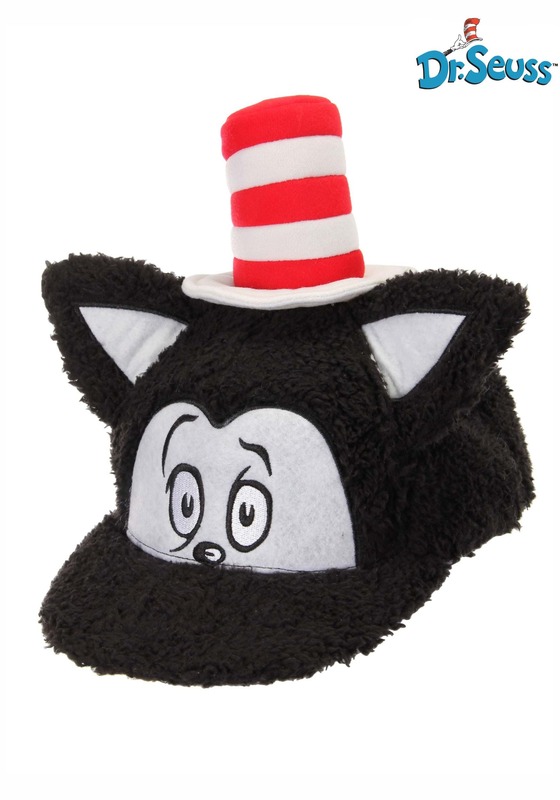 You'll be the Cat in the Hat pretty literally with this Dr. Seuss Cat in the Hat Cap. This fuzzy baseball style cap features the cat's curious eyes and fuzzy ears... plus the iconic red and white striped hat! The layers of cat-in-hat and hat-on-hat jokes are endless! What better clothing-based metaphor for Dr. Seuss' fantastic story could there be!? When we discovered this Cat in the Hat Cap, the first thing we had to figure out is if this was just a thematic cap or if the Cat, himself, use his unique chaotic powers to become a hat in a more literal sense. And... we still haven't figured out. But, whether you solve that quandary or not, you'll have a great time wearing this fuzzy Cat-Hat-Hat!